The Best Golf Ball Retriever of 2018 Revealed! What if we told you that we could save you money playing golf? According to CNN and Golf.com, 300 million golf balls are lost every year in the United States alone. On average, golfers lose 1.3 balls per round. The average golfer plays 23 rounds per year. That’s 29.9 lost golf balls per golfer. If you’re playing Titleist Pro V1s, that’s $124 annually on golf balls alone. That’s not a massive amount of money for one season, but over a decade or a lifetime, it adds up to a big chunk of change. While it elicits its fair share of eye-rolls, the numbers suggest that a ball retriever is a sound investment. There are likely dozens of models on the market, but some designs are inarguably superior. Some have a scoop design where others have a clip mechanism to secure the ball. They vary in size; and in this case, size really does matter! 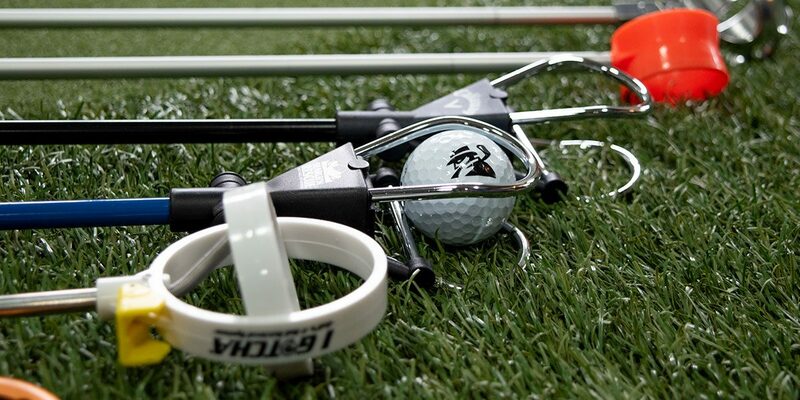 If you’re in need of a quality ball retriever, and that’s most of us – this guide is for you. Ball Security: You can’t retrieve it if you can’t secure it. The ones that have a scoop design work best for soft mud, but the ball can fall out when turning upside down. Well-designed options like the I Gotcha excel at securing the ball, but sometimes struggle if the ground is soft. Shaft Length: Size does matter because if you have a ball retriever that is too short, you won’t be able to reach balls that travel deeper into hazards. Granted you might not be able to reach the one that is in the middle of the lake, but the longer the shaft, the greater the chance you have at retrieving your ball. Handle: When retrieving your golf ball, you want to be able to do so without getting pain or imprints from the handle. Once extended, some models get heavy and dig into your palms. We noted that the Search N Rescue Magic Gripper features an especially comfortable handle. Sturdiness: When extended to full length, does the ball retriever droop or even snap? Some models like the I Gotcha are made from sturdier materials and hold their posture. Products that are lightweight tend to bend more and are less durable than ones that are slightly heavier like the Samyo. We’re always fine-tuning the process to make sure we’re collecting the best data possible. Continuing that trend we’ve updated and refined this year’s analysis to bring you the best buying advice to improve your game. We put in hours of testing, utilizing data-driven protocols to test new metrics. Over the course of the test, we used the same protocol for every ball retriever in the test. To limit bias, we paid careful attention to the phrasing of the questions as well as the timing of when particular questions were asked. Extension (25) – Does size really matter? Within this test, it does! 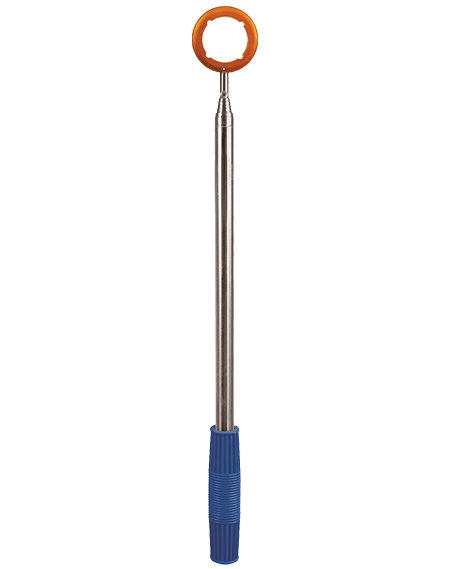 The goal of a ball retriever is to collect you ball that has finished in any kind of water. Some retrievers have a shorter reach than others which can hinder your ability to reach your ball. 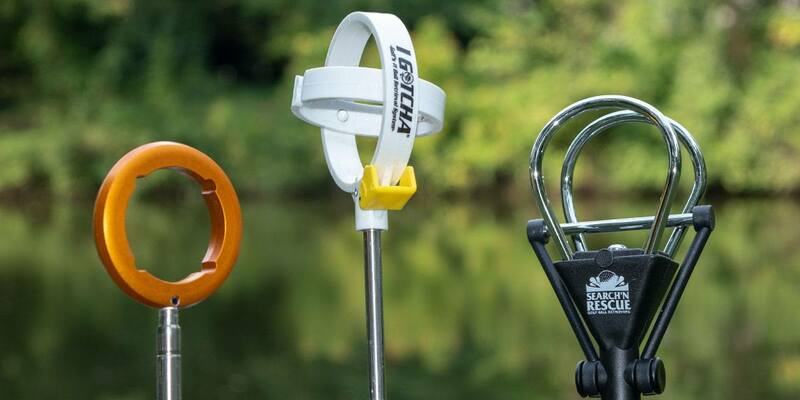 The bigger the pond, the bigger your ball retriever needs to be. Ball security (35) – After locating your stray shot, the next task would is to retrieve the ball. You want a retriever that holds your golf ball securely and can keep it secure until it reaches dry land. Not all products do this as well as they claim. Sturdiness (30) – When extending the retriever, gravity tends to take a toll which can cause the retriever to bend and in some cases snap. Some retrievers use sturdier materials which hold their shape when extended. Products that are lightweight tend to bend more and are less durable than ones that are slightly heavier. Handle (5) – The handle might not seem important to retrieving a golf ball, but it plays into effect more than you might think. A handle must be comfortable once retrieving the ball because all the weight is at both ends and can dig into the palm of the individual using it. Storage (5) – In some cases, carrying a retriever is like carrying an extra club. Some are the same length as your driver, while compact models are the size of your forearm. The retrievers that performed well in this category are the ones that fold down to the smallest size possible. The ones that did not perform as well tend to be the same length as a driver and took up space. Final grades were awarded based on total scores. Best Overall is our highest overall scoring the best ball retriever, and awards are awarded to the top three retrievers. 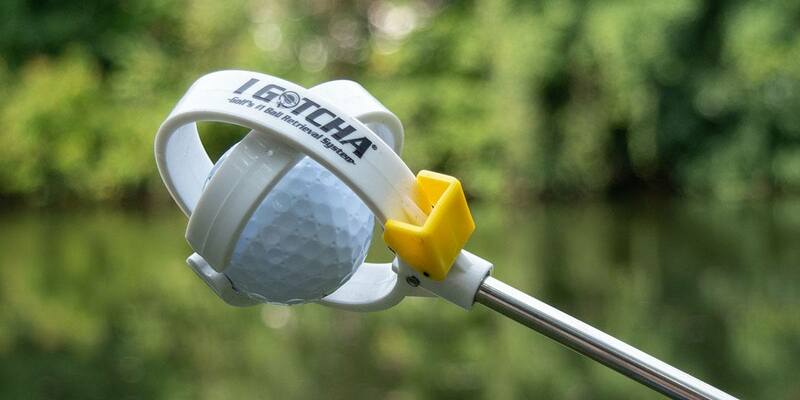 Our “Best Ball Retriever of 2018”, the I Gotcha features a patented spring release design that tightly secures the ball for easy transport to dry land. The model tested has a 14′ reach (other lengths available) allowing you go deep in the hazard. 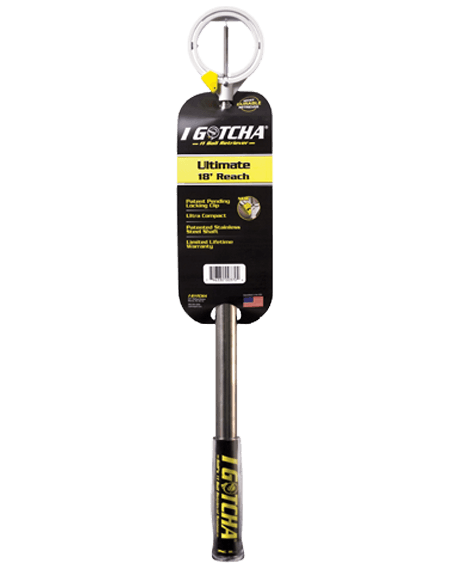 The I Gotcha doesn’t droop when fully extended, yet still collapses to a 20.5″ when not in use. Might be harder to collect the ball in soft or muddy conditions. Yet another great ball retriever that delivers what it promises. The Magic Gripper might not look like your traditional retriever, but it gets the job done. The single ring collector is sized perfectly to create enough friction that golf ball stays securely within the ring. Droops less than others when fully extended. 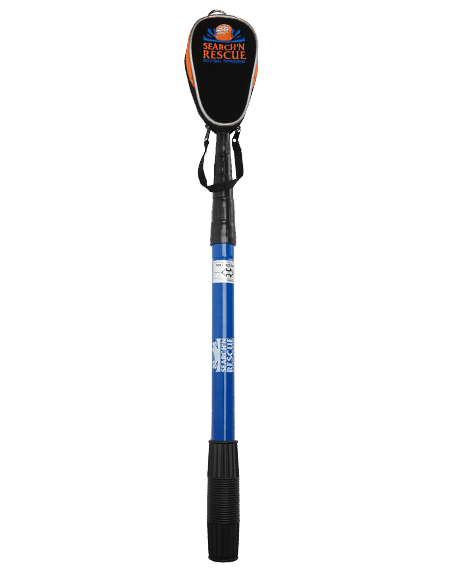 A bit like a pair of tongs, the Search N Rescue Blue allows golf balls to be grabbed with ease in all conditions. Balls can sometimes come loose during transport (especially when tilted upsidedown). Be quick about it, however, and you shouldn’t have any issues. Not that I need more golf bolls 🙂 Ive used various retrievers. My favorite is the Search N Rescue.. HOWEVER, the lever popped off of mine and I could not find it.. NOR could I find a way to replace it without having to BUY another Search N Rescue. Would be nice to just be able to get a replacement part as these are expensive retrievers. I use the I gotcha and routinely collect over 6 dozen balls each week. When they wear out and break, I call them and they send a new one. At first I thought I was in a time warp and it was April Fools day….really? I use my 3 iron. I own an “I Gotcha” retriever. I’ve had several of them through the years. It picks of balls better than any other I’ve owned. The Magic Gripper looks like a good retriever as well. I previously used the “I Gotcha”, but found when trying to pick balls out of bushes or past thick weeds, they’d catch on the spring loaded clip and I’d have to pull it out, reset it, and try again. This year I switched to the “Magic Gripper” and have really pleased with how well it does. It doesn’t look like it would work very well – but it’s really a pretty amazing ball retriever. When collapsed back down, it’s a perfect size to sit in a side pocket of my golf bag. I also highly recommend this one! Believe it or not, at our last club championship, the tournament officials decided to count ball retrievers as one of the 14 clubs in the bag. Several players were asked to remove the retrievers from their bags before starting play or be penalized for having too many clubs. Go figure! For $2.50 you can buy a roll of electrical tape start about six inches from the end start rapping in the same spot until you get a knob then rap down to the end. 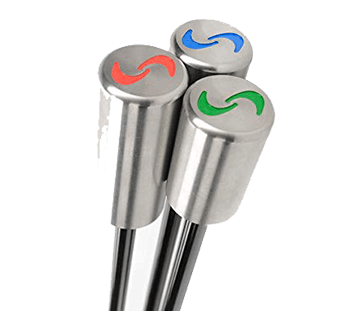 I’ve used the Callaway ball retriever for years – works well for me and never had an issue picking up the ball. telescoping issues or rust. I did lose the cover for it – but that’s not unusual for me. I’ve also had both the I Gotcha and the Magic Gripper. The plastic pieces on the I Gotcha break easily – and its fairly expensive. The all metal construction of the Search n Rescue products is key. This review hit me by surprise and I was interested to read through it. I have a Gotcha and have used it for years. It’s not perfect but 99% of the time when I need it to retrieve someone else’s ball it works well. I also like that it collapses rather short and fits in the long side pocket in my bag. I agree. I won an IGotcha maybe 10 years ago at a tournament. It’s the short 10 foot version. I wish it were a little longer, but I love how it fits in a pocket. I can judge how far is too far, so I only go after balls that are easily reached. I would add that another significant test will be the reliability of the said gadget. I have been a long owner of a few “I GOTCHA 14 FT”, at $45 a piece (used to be around $25 retail, I meant WOW, like another private equity got a hold of this company and jack up the price or what? ), and I finally gave up since it breaks down a lot. The quality is bad, the extension parts will fall apart and became loose in a few uses, it is not water friendly as any water residuals will result accelerate its demise. The spring will break or loose; the inner plastic ring will fall out easily… All and all, very poor quality at an unreasonably high price. There are quite a few classic out there that have better price-performance ratio, IMHO. I have switched to the following retriever and never had to look back. It was OEM by Callaway a few years back, but, I guess the relationship did not continue. Is someone paying you guys not to test golf balls? The materials inside? Whats in there? When they are cut in half, some are speckled. The cheaper ones especially. What’s up with that material? Which are cast urethane or not? Price on each? Durability of the covers? Uniformity among them..
Maybe just line them all up. Compare the 40 yard wedge shot. Try them off the driver, just for giggles, I know they supposedly all do the same thing off the driver, but lets see it again. Here’s something I’ve always wondered: are all of them perfectly round? 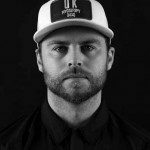 There’s a guy on Instagram who cuts golf balls in half (golf ball guts). One of the Chrome softs he cut in half had core that was wayy off center. If Im paying $44 for a case of balls, I’d love to know the cores are all centered. Bryson D floats his Bridgestone balls in an epsom salt solution to test roundness. Does he know something we don’t ? Or, review tees and golf ball washer brands next. Agree with others. Balls. Retrievers, ball markers, divot tools, towels, head covers, etc. have no business being reviewed here, IMO. I’d like to see a shaft comparison. It would be cool to see how stock offerings from the OEM’s compare to the high end stuff. You picked a good one IF you only consider the circular ones. The problem with the circular ones, however, is that you have to exactly place the circle on the ball. If you are slightly off, either left to right or front to back, you just stir up the bottom and are hosed. I have used your #1 pick and in my opinion, the Search and Rescue 2 ball retriever is vastly superior. It has a rectangular cage wide enough for 2 balls. You just put it on the bottom on the far side of the ball and pull toward you. It automatically locks the ball in. MUCH, MUCH easier and more foolproof than any of yours. Try one or ask around – you will never go back to a round retriever!! The one you are referring is similar to Blue Rescue that finished third and I agree that it worked very well. The only problem we found is that when storing it in your golf bag, it takes up a lot of room when it retracts and folds down to the size of a driver. Too bad you did not test the Golden Golf Ball Retriever. I used one for years when I was hawking balls at a nearby public course in Western New York. It was a no brainer in all conditions. I use the Search N Rescue Blue and it’s great. As stated in the review, very good at getting balls out of the water, which is where most of my lost balls end up. It is long though. Needs it’s own slot instead of fitting in a pocket. I still have a ball retriever I purchased in about 1970. With care, these last a lifetime. Unextended, it is, in fact, the longest “club” in my bag. I am not sure how much it has saved me in my lifetime, as I go fishing only for balls that are known to be mine. Yea, we look silly using one, but now that I am retired, money is money. If you want to save money, look around at garage sales and inspect before you buy. Nice review!—Still the only club that ever pays for itself. I have the S&R Blue Rescue and I think it’s great. As mentioned in the review, great at getting balls out of the water, which is where most of my lost balls end up. It is long though so I lose one of the 14 spots in my bag, but I’m not good enough to need a full set anyway. I Gotcha is worth it. Yes, muddy conditions is a bit dicey. You eventually get your money back and then some. Recall getting a good price on Amazon.